The direct payments value between South Africa and China/Hong Kong denominated in yuan soared to 31.3 per cent in June 2015 from 10.8 per cent in June 2014 and 4.6 per cent in June 2013. 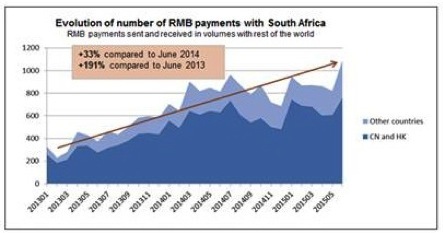 Recent SWIFT data shows that the number of payments denominated in Chinese yuan or renminbi (RMB) for direct payments between South Africa and China increased by 33 per cent over the last 12 months and by 191 per cent over the last two years. “The rise of yuan usage in South Africa is another good indicator of the cross border use of the currency”, Hugo Smit, Head of Africa South, SWIFT said. SWIFT provides financial messaging for more than 10 000 banks‚ securities institutions and corporate customers in 212 countries and territories. China was South Africa’s largest trading partner for the sixth consecutive year in 2014 with $60.3 billion in bilateral trade. To further deepen ties between these two BRICS members, South African Deputy President Cyril Ramaphosa was in China for an official visit from 13 July to 7 July that focused on economic and trade matters. Usage of the Chinese yuan as an international payments currency has soared by more than 400 per cent since June 2011. In January 2012 it was only ranked 20th with a 0.25 per cent share or almost half the rand’s 0.48 per cent share at the time. Since then there has been a concerted effort to make the yuan an international payments currency and in December 2012, the yuan moved above the rand in the rankings as the yuan moved to 15th and the rand to 16th. In April 2014 it displaced the Swiss Franc and was ranked seventh with a 1.43 per cent share and in June 2015 it was ranked fifth with a 2.09 per cent share having overtaken the Australian and Canadian dollars. The Crimean crisis in 2014 saw the South African rand overtake the Russian rouble as an international payments currency, because traders fled from the Russian currency in case more Western sanctions were applied. According to the latest SWIFT currency tracker, the share of the rand remained stable at 0.42 per cent between January 2013 and April 2014, while the share of the Russian rouble dropped by almost a third from 0.56 per cent to 0.39 per cent. In June 2015 the rand was ranked 15th with a 0.49 per cent share, while the rouble was ranked 20th with 0.22 per cent share.